The Monsignor Peter Blessing Council #5273 was founded in 1962 by a small group of dedicated men. They met in the basement of St. Vincent de Paul Church in the town of Coventry, Rhode Island, to explore the possibility of the formation of a Knights of Columbus Council. 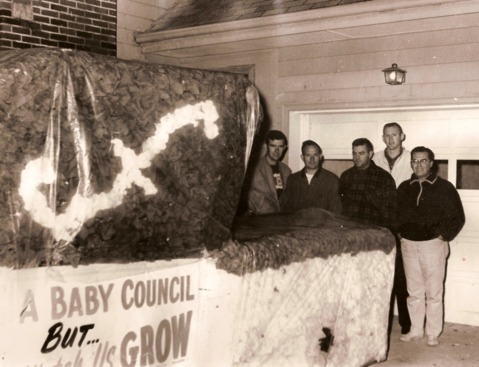 From this small group of men grew the 5,273rd council, established since that eventful day. This new offspring was to be named after a dedicated Knight who served as the faithful State Chaplain of the Rhode Island Knights of Columbus for more than 50 years - Monsignor Peter E. Blessing, L.L.D, D.D., V.G. (Vicar General). The first meeting was a disappointment since only three prospective candidates answered the call for applicants. 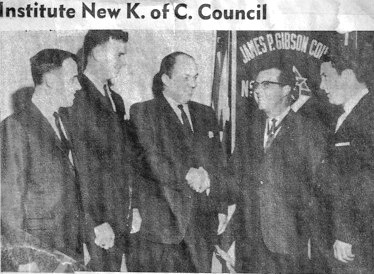 However, a program depicting the Knights of Columbus, helped along by Supreme, State and local spokesmen, featuring its insurance structure and the many achievements and accomplishments of the organization since its inception was instrumental in bringing in new prospects, including transfers to the new Council. The birth of a new Knights of Columbus Council in Coventry was imminent. 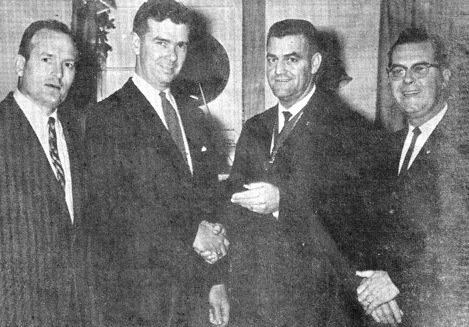 A few short months later, on April 15, 1962, a large turnout of members of the Knights of Columbus throughout the State of Rhode Island met at Gibson Council #181 in nearby Clyde (part of West Warwick) and instituted the Monsignor Blessing Council and initiated these 40+ men into the first degree of the Order. Shortly thereafter, the second and third degrees were exemplified at Gibson Council home and Monsignor Blessing Council started on a long and hoped for successful journey. The men that were chosen to be the leaders over the years turned out to be dedicated to the awesome tasks that loomed ahead, which at times seemed insurmountable, but they somehow mustered the energy and the strength of leadership to bring to a successful conclusion each Columbian year. 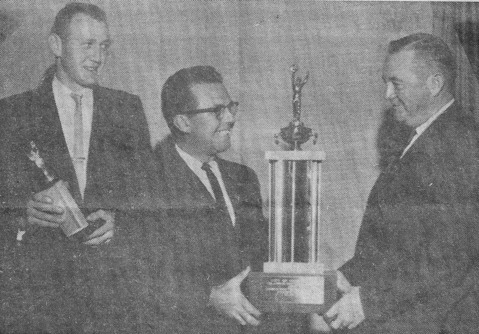 Accordingly, Monsignor Blessing Council has always been a successful council. Today, our Brother Knights carry on a proud tradition. While we are proud of our past and our many accomplishments, we also look forward to the future and how we can continue to live up to our order's motto, "In Service to One. In Service to All." A native of South Providence, and a product of paraochial schools and La Salle Academy, the Right Reverend Peter E. Blessing, L.L.D., D.D., V.G. 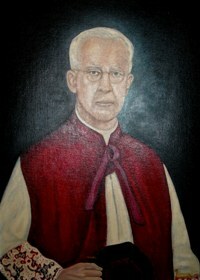 (Vicar General) had been pastor of St. Joseph's Church from 1916 to 1935 and before that, pastor of St. Edwards, both in Providence, and rector of the Cathedral of Saints Peter and Paul. He was assigned his last pastorate at St. Michael's parish from 1936 until his death in 1957. Indeed, it was a mark of honor for a parish to have named as its head the most widely experienced priest in the entire diocese, a priest whose devoted life spanned the very life of the diocese and whose wise counsel made him the good right hand of our bishops. Even when he arrived at St. Michael's to begin a new pastorate wtih youthful zest and enthusiasm, he was considered the elder statesman of the diocese. It didn't take long for St. Michael's parishioners to discover why. Monsignor Blessing was one of those uncommon men with a mind that bordered on the cosmic and that yet delighted in the immediate. He was a student of the world and yet his attention to details, to order around him, to the problems and needs of his parishioners, was constant, careful and unflaggging. With all of his tremendous repsonsibilities -- and he was a score of things besides pastor -- he never excused himself from the obligations and duties, large and small, of pastoral work. He was never too busy to pause in his comings and goings for a chat with the youngsters who passed him on their way to school. And when the hours for confession were at hand in the dark chapel, the Monsignor was always there in his box waiting for the first penitent, the enclosed light of the confessional illuminating the snowy white hair of a majestic head bent in prayer. The scope of his activities and the fatherly concern for the minutiae of parish life reflect the greatness of the man. In physical presence, Msgr. Blessing was a courtly man, tall and erect, handsome, a smile always on the edge of his lips, and his whole manner manifesting those old-fashioned graces that could charm without trying. Those old enough to have known the Monsignor will no doubt remember the characteristic shoulder shrug with which he punctuated his famed pulpit rhetoric. Beneath, he was all kindness and humility. He was a patient man who knew how to be impatient on occasion -- especially in connection with the theories of Freud which he denounced as Godless, and with the Nazi regime of Hitler, even before the true meaning of Nazism began to assert itself to the world. Simulataneous with his pastoral obligations, Msgr. Blessing served as vicar general under four bishops and for more than 40 years. On two occasions -- after the death of Bishop Hickey and following the appointment fo Bishop Keough as archbishop of Baltimore -- he was called on to administer diocesan affairs. And still he had energies and talents to spare -- as State Chaplain of the Knights of Columbus since 1915; spiritual leader of the Ancient Order of Hibernians of Rhode Island; president of the board of directors fo the Providence Visitor, and editor of the Visitor from 1909 to 1913; a member of the Diocesan Court; a member of the committee of vigilance; a trustee for the Infirm Priests' Fund; a director and treasurer of St. Joseph's Hospital; and head of diocesan cemeteries. In 1940, Governor Vanderbilt appointed him to the Advisory Council for the Blind. He served also as chairman of the Permanent Visiting Committee for the State Institution for two years. A number of Catholic societies called upon him for spiritual direction, amonth them the St. Vincent de Paul Societies, the Queen's Daughters, and the Catholic Women's Club. Bishop McVinney described him as the St. John of the diocese, his hand in all its accomplishments. At the blessing of the new chime of bells in the spring of 1939, Bishop Keough addressed the parishioners: "Msgr. Blessing is your Father in God. He is tender to you; he is joyful with you in all that is tender and joyful; he brings you messages in this church to love God...Remember Msgr. Blessing and the pastors before him; and pray God will spare him for many years to some." And the Providence Journal in an editorial at thet time of his death wrote that Msgr. Blessing was "wise and understanding, sound in counsel and farsighted in vision." His most modest explanation of his successes is church affairs was characteristically direct and simple: "I dedicate myself each day to God's way." During the trying years of a fatal illness, the Monsignor continued to say Mass and to direct the affairs of the parish. The smile never faded from his deeply creviced face. And he continued to indulge in his favorite recreation, the reading of the Bible and English literature. There was one other secret to the success of Rhode Island's St. John. In a press interview toward the close of his 84 years -- 58 of them in the priesthood -- Msgr. Blessing told a reporter that he was the only son of a man who "was a great Irish Catholic. I tried to be like him." Unquestionably, he was -- to the glory of the dioceses in general and we the members of this council which bears his name are mighty proud indeed.